Waymore Transportation is a refrigerated transportation company based in Fridley, Minnesota. 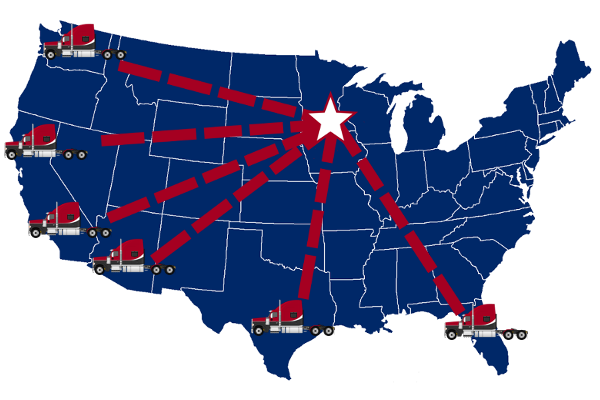 Our company is an LTL/TL carrier servicing the West Coast, Northwest, Texas and the Southeast. Waymore Transportation, Inc. is a refrigerated transportation company located 15 minutes north of downtown Minneapolis in Fridley, Minnesota. Our primary focus is to deliver our customer products with truckload (TL) and less than truckloads (LTL) in a safe and efficient manner. Our company is based on the safety and dedication of our company drivers and independent owner operators, while providing the best possible service to our customers. Waymore Transportation seeks to lease independent owner operators and company drivers who strive for the same goals. Benefits with Waymore Transportation, Inc. Successfully complete controlled substance test. Liability and Cargo insurance is paid by Waymore Transportation, Inc. However, we do require that you carry non-trucking insurance (bobtail) of $750,000 and physical damage insurance. We require a $2,000 claim reserve that is deducted out of your settlement checks (this money is put into an interest bearing account) and the cost for permits is $100.00 for the year. For more information, contact Dave Wecker. Waymore Transportation Inc. is always looking for safe and qualified Drivers, Owners & Operators. If you would like to join the team of dedicated drivers at Waymore Transportation you can learn more about applying here.